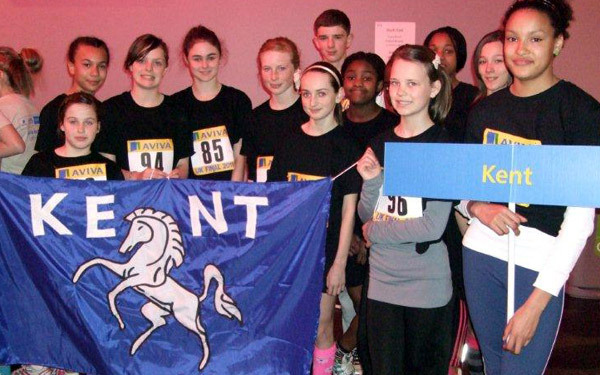 For the second year in a row the U/13 girls’ team from Kent qualified for the UK Sportshall Athletics Final at the LG arena at the NEC in Birmingham. After a worrying time on the Saturday evening when the hotel in which we had booked to stay did not have any power and so could not book us in. The hotel company fortunately found us another hotel which could take the 40 people in the group, but it meant that the early night turned into a late one. The team spirit shown by all was outstanding. The Obstacle relay team of Charlotte Dryland, Chantelle Bailey, Hannah Owen and Poppy Collins got the day off to a good start by winning the Gold in this first event. This was followed by Diana Adegoke taking the UK title in the Standing Long jump with 2.51m, unfortunately not getting the UK record, which she was hoping for. Rhiannon Wallwork just missed out on Gold in the Standing triple Jump by 1cm her jump of 7.17m won her the Silver medal. She made up for it in the 4 lap race. She easily won her heat 49.40s, and then went on to win the final 48.40s. Ememobong Umoh also just missed out getting a medal finishing 4th in the vertical jump with 57cm and Charlotte Dryland finished 4th in the Speedbounce with 86 just one bounce off a medal. Poppy Collins finished 8th in the same event with 80 bounces. Tamara Anderson came 8th in her Standing triple jump 6.64m. The 4x2 relay team Diana Adegoke, Ememobong Umoh, Charlotte Tappenden, and Joanne Okusanya came 3rd in their heat and qualified for the final where they came 4th.Lydia Gallyer-Barnett covered the Standing long jump and the 4 lap race and Amber Guyatt the High jump and the 6 lap race. Our final UK champion was Ben Isaac who qualified for the UK final as an individual in the Triple Jump and went on to win in fine style with 7 .50m. The team finished in 6th place in a much tougher competition than 2010. Well done to all who took part and thanks to Mick Duffin, Brian Charlton and Laurie Rand for officiating on behalf of Kent, Pat Hanys for being my assistant team manager and to all the parents and supporters who came as well. Yes they did it again. 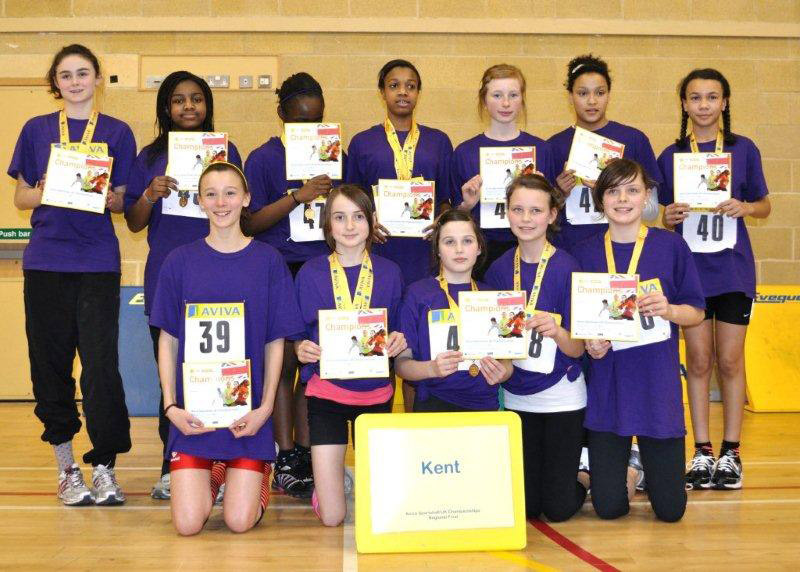 The Kent U/13 Girl’s Sportshall team qualified for the National Final at Birmingham on the 3rd April. 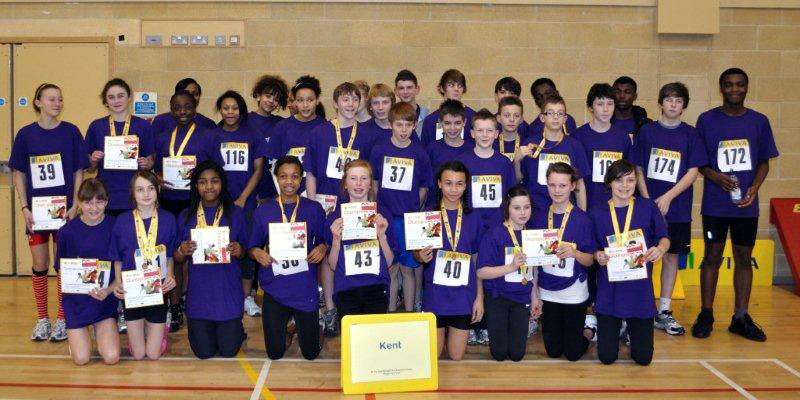 It was a great team effort - the winning margin over Hampshire was 74 points. A total of 12 medals were won. Rhiannon Wallwork (Invicta EK), part of last year’s winning team, won a Gold medal in the Standing Triple Jump 7.19m and Silver in the 4 Lap race. 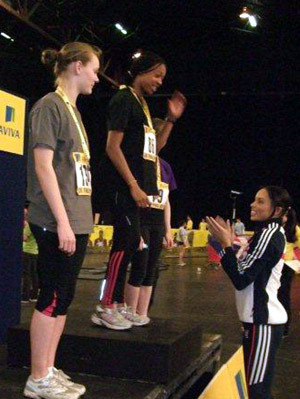 Diana Adegoke (Thanet) won three medals - Gold in the standing long jump 2.51m, just 4 cm off the South East Regional Record of 2.55m, which she had equalled at Canterbury in January. She claimed Silver in the 2 Lap race. Diana was also part of the Gold medal-winning 4x2 Relay team. Ememobong Umoh (Ashford A.C) continued her winning run in the Vertical Jump winning Gold with 61cm. Ememobong also ran the 4x2 Relay joined by Joanne Okusanya (Bexley A.C) and Charlotte Tappenden (Ashford A.C). 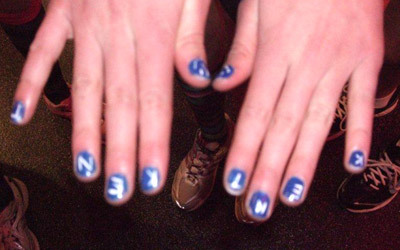 Poppy Collins (Invicta EK) won Silver in the Speed Bounce 85. 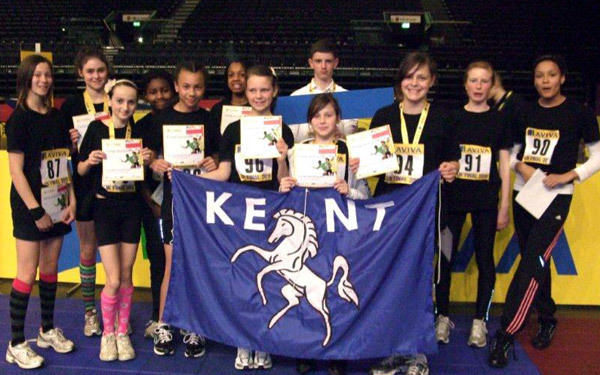 Kent also won the Obstacle Relay of which Poppy was a member, along with Charlotte Dryland (Ashford A.C.), Hannah Owen (Ashford A.C) and Chantelle Bailey (Thanet). Hannah had trapped her fingers in a car door a few days before but still managed to compete in the Shot. Lydia Gallyer-Barnett (Invicta EK), despite jumping 2.16m in the Standing Long Jump, could only finish 6th. Amber Guyatt covered the High Jump and 6 Lap time trial in which she finished 8th. Tamara Anderson (Thanet) jumped 6.46m in the Standing Triple Jump to finish 7th. The U/13 Boys did exceedingly well finishing 3rd, missing out on 2nd place by 3 points. The winning team – Sussex- won by 30 points. This was Kent’s highest place for several years. Gabriel Ibitoye (Blackheath & Bromley A.C) won a total of 3 Gold medals. His first win was in the Shot where he putt 12.42m, the second was the 4 Lap race and the 3rd was won with Daniel Steadman (Ashford A.C) in the 8Lap Paarlauf. Ben Isaac ( Ashford A.C) won the Standing Triple Jump 7.57m, Alex Lynch (Ashford A.C) claimed Bronze in the Standing Long Jump 2.20m, Edward Miller (Ashford A.C) finished 5th in the competition with 2.14m. 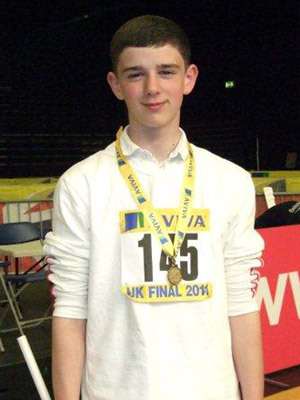 Lewis Hagger (Ashford A.C.), who joined the team at the last minute, won a Bronze medal in the High Jump with a PB of 1.40m. Reece McCarthy (Blackheath & Bromley A.C) just missed the Bronze medal in the Shot finishing 4th with 9.21m. Jamie Clarke (Paddock Wood A.C) came 6th in the Speed Bounce with 74, Oliver Marsh (Ashford A.C) 7th with 73. Kieran Hawkins (Invicta EK) came 5th in the Vertical Jump with 51cm. Owen Morgan (Ashford A.C) was 6th with 49cm. Sam Marsh (Ashford A.C) covered the 6 Lap race and the Standing Triple Jump. In the U/15 Girls all-rounder competition, our only medal – Silver - was won by Renique Joseph (Bexley A.C) in the Vertical Jump 65cm. There were some 4th and 5th places. Rachel Laqeretabua (Tonbridge A.C) was 4th in the 4 Lap race and 5th in the Shot Putt. 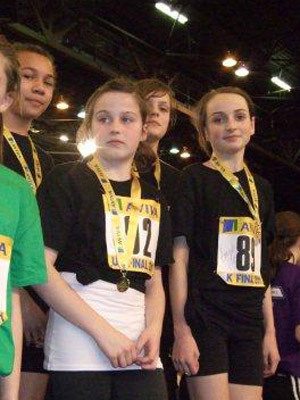 Lauren Bamford (Ashford A.C) came 4th in the Standing Long Jump. Samantha Leighton (Blackheath & Bromley A.C) came 6th in the Vertical Jump, Daisy Enughwure (Bexley A.C), Alex Wheelwright (Blackheath & Bromley A.C) and Shannon Cordell (also Blackheath & Bromley A.C) made up the team. Renique finished 5th in the overall event out of 47 competitors, Rachel Laqeretabua was 11th, Lauren Bamford 22nd, Daisy Enughwure 31st, Samantha Leighton 39th. Shannon just competed in the Paarlauf. Most of the girls are first year U/15s and should make it into a good team for next year. The girls finished 5th. Thanks to Kieran Regan and Jack Huxley (both Ashford A.C) stepping in at the last minute, Kent had a U/15 boys’ team to enter. The U/15 Boys also only won one medal. Nathaniel Fatola (Ashford A.C) claimed the Silver medal in the 2 Lap race. Sam Ratcliff (Paddock Wood A.C) was 6th in the Shot Putt. Temi Banwu (Ashford A.C) came 8th in the Speed Bounce. Joseph Holland (Paddock Wood A.C) was the 6th member of the team. In the overall results Nathaniel Fatola came 5th, Sam Ratcliff was 17th, Temi Banwu 23rd, Kieran Reagan 31st, Joseph Holland 41st and Jack Huxley 42nd, and the team finished 6th.